Summertime also means water time! This fine motor water activity is perfect for keeping my toddler class nice and cool while they work on strengthening their fine motor muscles. I’m always looking for ways to take learning outside, but with the summer heat coming in full force around here, finding ways to stay cool has been more difficult. In fact, we’ve had record breaking temperatures this last week and eight days of over 100º heat, which means that by 10am it is already 85º! But, even with this heat we can’t bare to stay inside all morning; there are too many fun ways to learn outside! 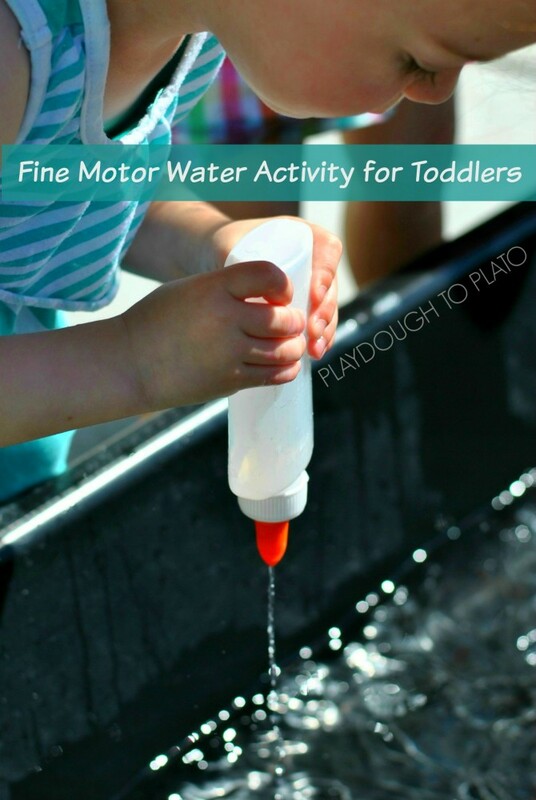 This fine motor water activity is one activity my preschoolers loved! As a teacher, I loved that it met some of my teaching objectives, and the kids loved that it was also cooling water play. I have to admit, this activity was crazy easy to put together, even cheaper than it was easy, and you probably have absolutely everything you need for it right now, which means your kiddies could be occupied in less than five minuets. The fine motor water activity I set up for my toddler preschool class kept those little learners busy for the better part of a half an hour, and one of my students spent the entire hour of outdoor learning at the water bin with this activity. If you want to learn more, hop on over to Playdough to Plato where I walk you through the set-up, as well as share with you all the amazing learning that took place. Not only did my toddler preschoolers gets lots of fine motor practice, they also learned a bit of science along the way.